What is Vistabex 50 U? 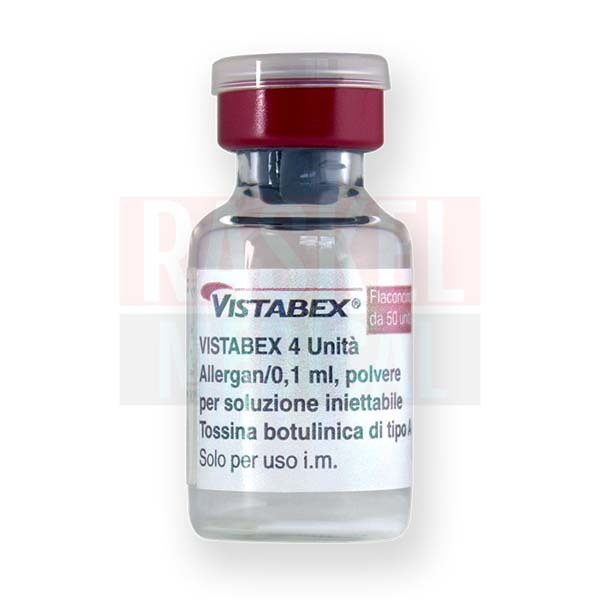 Vistabex is a botulinum toxin used to temporarily improve the appearance of dynamic wrinkles in the upper facial area, including moderate to severe glabellar lines, horizontal forehead lines, and crow’s feet. Over time, some patients develop skin creases or wrinkles that are caused by repeated muscle motion. These are known as dynamic wrinkles. Repeated facial expressions, like frowning or squinting, can result in forehead wrinkles (known as worry lines), glabellar lines (known as frown lines) and crow’s feet. As a neurotoxin, Vistabex is able to prevent the release of the neurotransmitter acetylcholine. Upon injection, this produces localized chemical denervation, causing subsequent reduction in muscle activity. When administered into the muscles involved in creating dynamic wrinkles, the muscles relax, smoothing the overlying skin and softening the treated wrinkle. 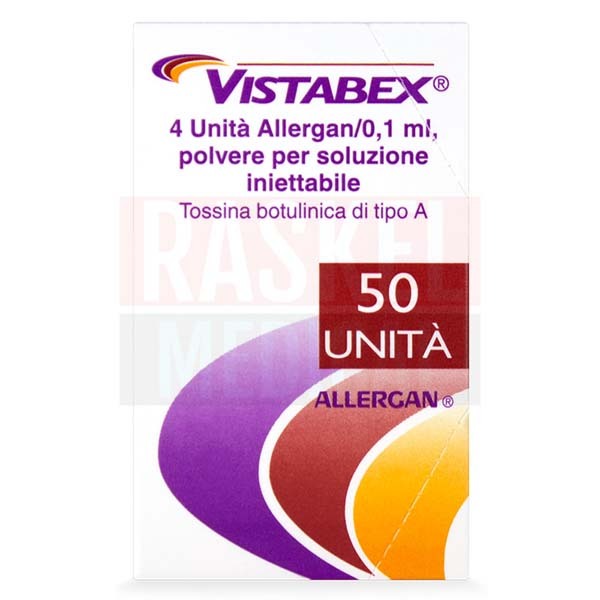 Vistabex is made by Allergan Inc., a global provider of medical aesthetic treatments. This product is made in Europe. It is also known as Vistabel. Vistabex is supplied in vacuum-dried form, as a white powder. 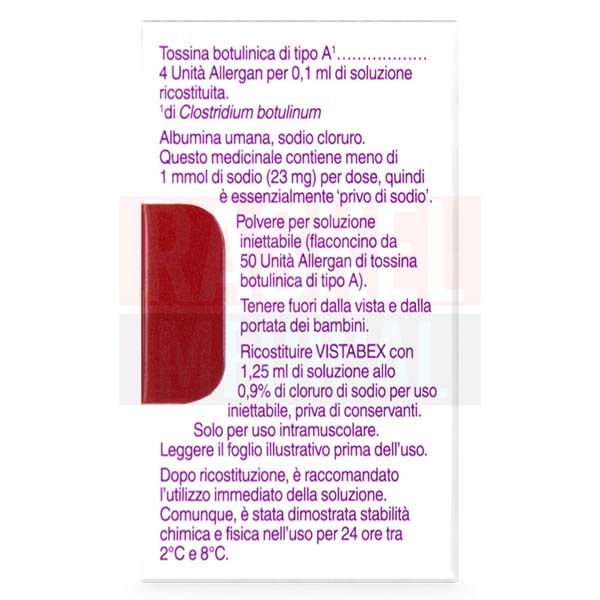 The medication contains Clostridium botulinum toxin type A together with the inactive ingredients human albumin and sodium chloride. Vistabex should only be administered by a physician with the appropriate qualifications and experience in the treatment and use of required equipment. To prepare the treatment solution, reconstitute the lyophilized product by adding 1.25ml of diluent (0.9% preservative-free sodium chloride solution) to the vial, diluting the product to a concentration of 4.0 units per 0.1ml. The reconstituted solution should be clear, colorless to slightly yellow, and free of particulate matter. Glabellar lines: Inject 0.1ml (4 U) reconstituted Vistabex in each of the 5 injection sites: 2 injections in each corrugator muscle and 1 injection into the procerus muscle for a total dose of 20 units. Forehead lines: Inject 0.1ml (4 U) reconstituted solution into each of the 5 injection sites in the frontalis muscle, for a total dose of 20 units in a total volume of 0.5ml. Crow’s feet: Administer 0.1ml (4 U) reconstituted Vistabex in each of the 3 injection sites per side (for a total of 6 injection sites) in the lateral orbicularis oculi muscle, for a total dose of 24 units in a total volume of 0.6 ml (12 Units per side). 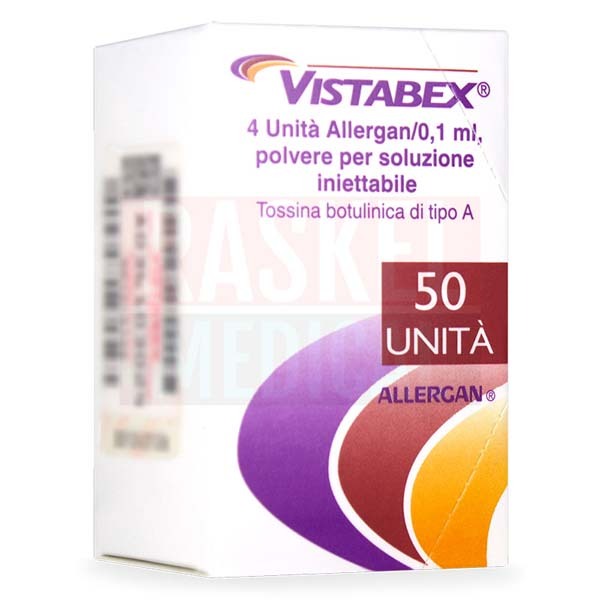 1 vial containing 50 units of Vistabex. Patients can expect the results of treatment to last about 3–4 months after injection. Store in a refrigerator between 2°C and 8°C. Do not freeze or reuse any reconstituted Vistabex. If there is any remaining solution, discard it. 3 years. After reconstitution, the solution should be used within 24 hours. Most adverse reactions from Vistabex use occur within the first few days after treatment, and are of mild to moderate severity. Treatment with Vistabex may result in pain, stinging, edema, and bruising at the injection site. Instances of fever and flu-like symptoms have also been reported after botulinum toxin injections. As with all botulinum toxins, there is the potential for adverse reactions related to toxin diffusion distal to the injection. Such reactions include muscle weakness, dysphagia, constipation, or aspiration pneumonia, which may be fatal. If your patient notices any of these symptoms developing, they should seek immediate medical help. Which skin type is this filler suitable for? This botulinum toxin injection is appropriate for all skin types, but is particularly suited for aging or mature skin. What this formula is made without? The formulation is free of preservatives. This product is lyophilized and supplied in glass vials. Each vial is fitted with a rubber stopper and an aluminum seal.